Topeak's Dual Touch Bike Stand is an easy to assemble and elegant solution for storing your bikes. 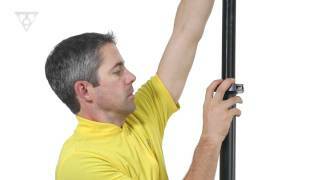 Looks great in the house or in the garage, as the black pole will contrast to your chosen interior or exterior. The stand comes with two bike mounts, which can hold up to four with optional mounts. In addition, the handy quick release structure is great for adjusting the height and the angle of your bikes, can be ideal if you are working on a specific part of your bike or you are tight for space.